But don’t worry. You can fix the PS4 error code CE-34878-0 quickly and easily. There are solutions to this problem. This article guidelines 7 easy methods to fix the PS4 error code CE-34878-0. You don’t need to try them all; just work your way down until your problem is solved. Why does the error code CE-34878-0 occur? This is one of the most common error codes you may get when you’re playing the PS4 games, and sometimes it may also display as CE-36329-3. This error occurs because the games or applications crash. Generally speaking, it is caused by the PS4 corrupted data or the system software issues. You can try the solutions below to solve this problem step by step! This problem can be caused by the hardware faulty, so you can firstly try to restart your PS4 console and your PS4 controller to make it reconnect and work again. 1) Completely turn off your PS4 console. 2) Completely turn off your PS4 controller. 3) Reboot your PS4 console and then your PS4 controller. 4) Try to open that game that occurs the error and see if it works. 1) On the PS4 home screen, highlight the game/application that needs to update. 2) Press the Options button on your PS4 controller, then select Check for Update. 3) Follow the wizard to download and install any available updates. 4) Restart your PS4 and try to play the game to see if it works now. If directly updating the game doesn’t work, you can uninstall and reinstall the game to have a try. Note: You’ll need to save the game data first before you uninstall the game so that you won’t lose the progress. 1) Go to PS4 Settings > Application Saved Data Management. 2) Select Saved Data in System Storage if you want to save it in your PS4 system, or you can select Saved Data on USB Storage Device in you have inserted the USB drive into your PS4. 3) Follow the instructions on your screen to finish. 4) After that, go to PS4 Settings > System Storage Management > Applications. 2) Find the game that occurs the problem and highlight it. 3) Press the Options button and select Delete. 5) Reinstall the game, and try to launch the game to see if it works. This method works if you are playing games on the disc. 1) Run a clean uninstallation of the game from your hard drive disc. 2) Power cycle your PS4 to make it completely off. 3) Reinstall the games and updates. 4) Try to launch the game and play to see if it works now. Note: Please close the games and applications that are currently on before you update the system software. 1) Connect your PS4 with the Internet. 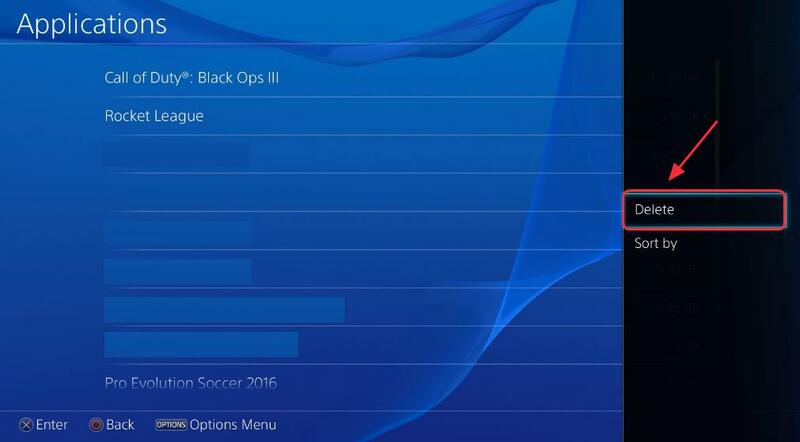 2) Go to PS4 Settings > System Software Update. 4) Wait for the update to download. After downloading, you’ll see the popup notification to remind you. 5) On your PS4 home screen, go to Notifications > Downloads, then follow the instructions to install the update. 6) Try to open the game and see if it works now. If you have upgraded your Hard Disc Drive (HDD) recently, it may also impact the game performance. So you can try to install the original HDD back in your PS4 to solve this problem. Before you reinstall the original HDD, you may need to back the data currently saved in your PS4 first. Note: You’ll need a FAT32 or exFAT-formatted USB device with plenty of free space. If you don’t have enough room to back up everything on your drive, you can choose to not back up Application Data. 1) Insert the USB storage device for the back up into one of the PS4’s USB ports. 2) Go to Settings > System > Back Up and Restore. 3) Confirm which data you’d like to back up. If you choose not to back up applications, you’ll need to download or reinstall them when/if you eventually restore with the back up you’re creating. 5) Customize the name of the back up. Once you’ve done that, highlight Back Up and press the X button. 6) Wait for a few minutes until the process finishes. 7) After the backup, install the original HDD in your PS4. 8) After installation, try your games again to see if it works. This method works for many PS4 users. If you are still getting the error CE-34878-0, you may try to initialize your PS4 to fix it. Initialization deletes data saved on system storage and deletes all users and their data from the system. 1. When you initialize the system software, all settings and information saved on your PS4 system are deleted. This cannot be undone, so make sure you do not delete any important data by mistake. Deleted data cannot be restored. It’s recommended to backup you data into PS plus or USB drive before the initialization. 2. Do not turn off your PS system during initialization. Doing this might damage your system. 1) Go to PS4 Settings > Initialization > Initialize PS4. 3) Follow the instructions to complete. 4) After finishing, restore all your backup data, and reinstall the games and applications. 5) Try the games to see if it works now. 1) Go to PS4 Settings > Devices > Turn off Device. 2) Select the camera to turn off. Then power cycle your PS4. 3) Go to PS4 Settings > User > Login Settings. 3) Uncheck Enable Face Recognition. 4) Try your game/application again. If the problem still persists after trying all the methods above, we’re sorry that it seems to be a problem beyond our ability, and you may need to contact Sony for support. You may need to send back your PS4 to repair, or you may require to have a new replacement for your PS4. That doesn’t cost too much if your PS4 is within the warranty period. These are the solutions to solve the error CE-34878-0. Feel free to comment below to share your idea, or you can write down what helps you through to help those who are facing the same problem as you did.